NEWS FLASH: WHS CLASS OF 1976 STEPS UP!!! At their reunion in August 2016 the fabulous Class of ’76 generated a $500 contribution to the Wilson Scholarship Initiative. This year the school's Scholarship Initiative fund awarded two $1000 scholarships to deserving graduates and made a start on raising $50,000 to endow a fund through Oregon Community Foundation to provide scholarships in perpetuity for Wilson grads. Thank you Trojans of ’76, we are grateful for your support. Twelve men from Wilson’s Class of 1984 completed the 198-mile Hood to Coast Relay on August 26-27, 2016. They finished 4th place in the Men’s Super Master division (50 and older) and 524th overall out of 1050 teams! 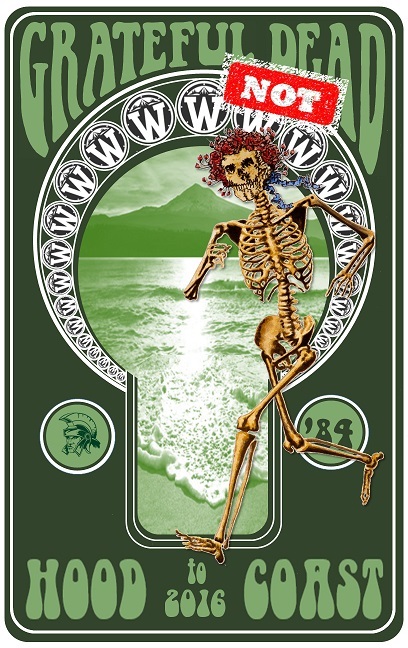 The Wilson alums called themselves “WHS Class of ’84 Grateful Not Dead Touch of Grey,” which pays a nod to the music of their time as well as their current hair color. Because all of the runners were at least 50 years old, the team competed in the Supermaster men’s class. Most of the runners reside in Portland, however, some flew in from Idaho, Colorado, and even Ireland for the event. The team consisted of Sean Fennessy, Tom Diffely, Randy Acker, Mike Yoder, Rob Gilbert, and Ed Sloop in Van 1, which was driven by Ian McLoughlin, and John Whittier, Andy Sloop, Tom McKillop, Ken Venables, Tim Landis, and John Kodachi in Van 2. Fellow ’84 classmates Paul Cameron, Greg White, and Ken Shults pitched in different ways to support the team, including Ken designing the team’s shirt. Well done! Most people find their “tribe” in college – making their most lasting friendships there. But for me, Wilson High School provided me with a group of people I am still proud to call my “best friends.” We were all involved in drama and music and formed a bond that continues to this day. I would have to say that Sara Cole and Nancy Danner are the two with whom I keep closest contact, and a project we resurrected from the past has solidified that bond. 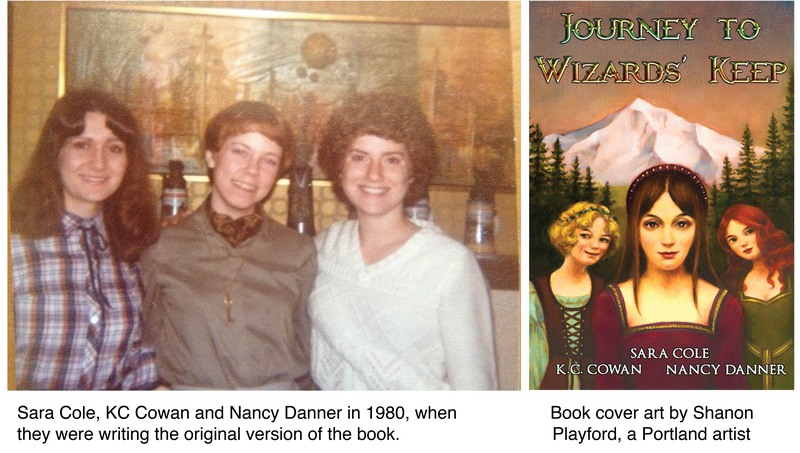 We all went to different colleges – I went to Oregon State, Sara attended Portland State, and Nancy went to U of O. In 1978, Sara had just finished reading “Lord of the Rings” and decided she wanted to write her own fantasy novel. So, she wrote chapter one of “The Log,” in which she named herself Princess Irene of Cabbage who had a best friend, Nan the Dancer. She sent a copy off to Nancy and asked her to write the next chapter. It then came to me. In Chapter 3, I introduced myself as a character, Kay of the Crystal Seas, and we were off and running. Sadly, Nancy was a student teacher in our senior year and had little time for writing. Although Sara and I always kept her in the loop and asked her to write a chapter, she basically dropped out. We used familiar settings from our state and changed the names. For example, the girls live in the Valley of William Etté near the Hooded Mountains. We put all our friends in as characters. Not that they were really similar to the people in the book – it was more like casting a play. If we needed a villain, well, Richard would make a good one, so let’s make him the bad guy. We wrote chapters between 1978 and 1982, eventually filling two large three-ring binders with hand written and Xeroxed copies. Eventually though, life got busy and we dropped it. However, I never threw out my copy. It sat in my basement for decades and when I got married and moved, I brought it with me, even though I hadn’t looked at it once in all that time and we three never even talked about it. Fast forward to 2012. I was out of work with time on my hands. Out of the blue, Sara asked me if I still had “The Log,” and if so, would I consider typing it up so we all could see it again? Both she and Nancy had lost their copies. So I did and we took great delight in seeing what we had done. However, when we got to the last chapter, we discovered we had just stopped and not completed the story! By now, we were all invested in it again, so one time when Nancy was up from California on a visit, we mapped out the finish and thirty years after we stopped writing, we brought the story to a conclusion. Irene, Nan and Kay join forces to defeat an evil wizard and save the land. TO celebrate, I printed copies for us at Powell’s Book Machine. Like most first time authors, I made mistakes, pitched it too soon and got a lot of rejections. But on July 31st, 2015, I got a “yes” from Ravenswood Publishing – a tiny boutique publishing company. The past year has been a whirlwind of working with editors, cover artist, and learning how to help market it. Best of all, Sara and I continued writing and completed a sequel, with a third book nearly done. Who could have imagined my life would take this turn? And that something we wrote just for fun would be published? I just know that when “Journey to Wizards’ Keep” comes out, I will be forever grateful that I found my two best friends at Wilson High School. Journey to Wizards’ Keep is available on Amazon.com, Createspace.com, Kindle, iBooks, KOBO, NOOK, and Audible.com, starting September 25. Event: Annie Bloom's Books will be hosting a reading from Portland author KC Cowan on Thursday, November 3, 2016 from 7:00pm to 8:00pm. Event address: Annie Bloom's, 7834 SW Capitol Hwy, Portland, OR 97219. Susan Lee Laspa (Kennedy Schuler) '64 who died in Islamist terrorist attack on World Trade Center, September 11th 2001.